Home College What did we learn from UConn at Notre Dame? 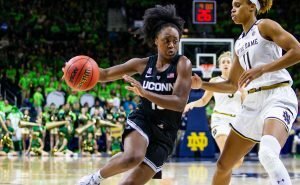 What did we learn from UConn at Notre Dame? Christyn Williams blows by Brianna Turner in the UConn-Notre Dame match up three weeks ago. Photo courtesy of Connecticut Athletics. The latest chapter of one of the most fierce rivalries in college basketball is in the books – a convincing win by then-No. 2 UConn over then-No. 1 and reigning National Champion Notre Dame – the result of which reversed rankings for the two teams. Williams played all 40 minutes, scoring 28 points on 11-16 field goals, including 2-4 from beyond the arc. She even played pestering defense on Marina Mabrey, which was at least partially responsible for Mabrey’s uncharacteristic 4-17 shooting. Naturally, UConn coach Geno Auriemma was pleased. But he was not surprised. “[A reporter asked her a question] and she said ‘I was born for this,’” Auriemma said. 2) Notre Dame’s best player is Jackie Young, not Arike Ogunbawale. Ogunbawale rightly received accolades for hitting two high-pressure last-second shots to win two Final Four games in last season’s tournament. But the player who dominated the Huskies in that national semifinal was then-sophomore Young. She scored 32 points on 10-15 shooting, including two threes and 10-11 free throws. UConn’s best defenders simply could not contain her. Young’s performance in that game has carried into this season, where she has an outstanding .538 field goal percentage, and leads the Irish in both three point (.429) and free throw (.787) percentage. All of those numbers are better than Ogunbawale’s, even though the latter has taken 67 more shots on the season (173 to 106). Ogunbawale has taken 20 percent of Notre Dame’s shots, but her shooting percentage – a decent .451 – is 87 points below Young’s, 120 points below Jessica Shepard’s and 89 points below Brianna Turner’s. Maybe she should pass the ball more? 3) Notre Dame was not ready for the pressure of being the top team in the country. Being National Champion carries a huge weight, which is a big reason so few teams repeat. This Irish team was supposed to be an exception, however, because they returned their most prominent four starters, and regained the talented Turner from a year-long injury. Many were predicting an undefeated season. Perhaps Notre Dame’s players read too much of their own publicity. Perhaps they believed that UConn, having lost two top ten WNBA draft picks, was going to be a weak team. Whatever the reason, the Huskies out-hustled and out-toughed the Irish for the entire contest. That was the reverse of their last meeting in March, where UConn seemed out-of-sorts and sometimes passive. Notre Dame played poorly for much of the game, taking and missing too many contested shots, and allowing the shorter Huskies to beat them to rebounds. The game plan was to feed the ball to their post players, yet the Irish posts, Turner and Shepard, combined for just 20 shot attempts – most of them in the first half. Mabrey – an historic UConn crusher – had a terrible night (4-13, 1-6 3PT), harassed by the quicker, equally-tall Williams. Mabrey missed three games earlier in the season, but was healthy enough to play all 40 minutes, and no one suggested that her poor shooting was a result of time off. Malaise at home is a rarity for Notre Dame. But then, they’ve only been National Champions twice, with a hiatus of 17 years. It takes some adjustment to meet the expectations of a top ranking. The Irish don’t seem to have made that adjustment yet. 4) Arike Ogunbawale is easily-frustrated. Husky Crystal Dangerfield defended Ogunbawale for most of the game. The sophomore is much stronger than she was last season, and matches Ogunbawale in height and quickness. She allowed Ogunbawale very few open looks, and even with her athletic skill set, she missed far more shots than she made. It took lots of work to find an open shot, and she finished just 6-18 on the day, missing all six three-point attempts. By the fourth quarter, Ogunbawale was jawing at the officials, and exhibiting impatience and frustration. She was assessed a technical foul for talking to Auriemma, and her later foul on Dangerfield was ruled unsportsmanlike. There is no evidence that McGraw disciplined her player, or that anyone at Notre Dame apologized to Dangerfield or to UConn. 5) UConn will be alright. Williams proved herself to be a worthy starter and a star in the making. Sophomore Megan Walker, who was tentative as a freshman, played within herself and stayed poised throughout, finishing with 12 points and eight rebounds. Olivia Nelson-Ododa, the Huskies only backup post player, had a good outing, which could presage productive bench minutes when it matters in March. 6) Notre Dame should be much better by season’s end. McGraw is a Hall of Fame coach for a reason, and she will get the Irish focused in short order. Turner has been back with the team just nine games, after missing an entire year. The offense will learn how to better exploit her skills in the paint. Perhaps McGraw will force Ogunbawale to share the ball with her high-percentage shooters a bit better. The biggest roster question is whether this team can be great for another year without a true point guard. Mabrey handled the job last season and her team won it all. She is, however, is a point guard only by default. The injured freshman Jordan Nixon is a point guard, but asking her to lead the team for major minutes would be a stretch. Young could be the answer, and McGraw has talked about using her at the point. She leads the team in assists with 43, and has turned it over just 20 times. Most important, the Irish have likely discovered that good press does not equal success. Toughness has been a hallmark of McGraw teams for many years, but they showed little of it in this game. For sure, they lost one of their toughest when Kathryn Westbeld graduated. Shepard seems to have it, if they will give her the ball more often. It’s only December. A rematch in the NCAA tournament is a strong possibility, and this game predicts nothing about the outcome of that hypothetical contest. Auriemma knows this too well.